In the second of the two blog posts noted above, Of Filters, Great and Small, I considered the different possible structures that filters might take, and this is a more nuanced view of the great filter that departs from the idea that a single element of the great filter is uniquely responsible for the great silence and the Fermi paradox. The journey to higher forms of emergent complexity seems to be robust, and therefore likely to have been repeated elsewhere, but it is also a long journey of later emergent complexities multiply supervening upon earlier emergent complexities. This structure of emergent complexities over time is itself a structure more complex than any one of the emergent complexities taken in isolation. In so far as we understand the great filter in this content, we understand a more nuanced view than the idea of one step among many steps along this journey being the unique hurdle to the aggressive expansion of life in the universe, and therefore its visible traces discoverable through cosmology. Even given this more nuanced view of the great filter, later forms of emergent complexity will be less common than earlier forms, and within the structure of the great filter we can identify particular emergent complexities where the iterated structure falters. If we place this stalling point at exponential encephalization, we might find a universe filled with complex life, but with few or no other intelligent species capable of building a civilization. This is the sense in which I wish my claim that encephalization is the great filter to be understood. Recently I have had reason to revisit the idea that encephalization is the great filter, and this is primarily due to having read The Social Conquest of Earth by E. O. Wilson, which emphasizes the role of eusociality in the construction of complex societies. I think that Wilson is right about this. Wilson notes that eusociality has emerged on Earth only a handful of times, making it a rare form of emergent complexity: “Eusociality arose in ants once, three times independently in wasps, and at least four times — probably more, but it is hard to tell — in bees.” (p. 136) We can compare this rarity of eusociality as an adaptation to the rarity of intelligence as an adaptation. The insects that have achieved robust eusociality — perhaps I should say arthropods — are very different from mammals. We must go back more than 500 million years to the split between protostomes and dueterostomes to find the last common ancestor of the two. With the arthropods we share being bilaterally symmetrical, but the split between us — hence the split between our brains and central nervous systems (CNS) — is about as old as the split between mammals and molluscs: chordata, mollusca, and arthropoda are distinct phyla. On the one hand, we know from a recent fossil find something about the CNS of the earliest chordates, which we thus have in common with most other terrestrial animalia (cf. How early a mind? ); on the other hand, we also know that neural structures have evolved independently on Earth (cf. The ctenophore genome and the evolutionary origins of neural systems), so that we might speak of neurodiversity among terrestrial animalia. Different brains, when sufficiently complex, are substrates for different forms of emergent consciousness, i.e., different forms of mind. It is not only dramatically different kinds of minds that might give rise to dramatically different forms of encephalization, and thus intelligence and civilization. Part of the differentness of eusocial insects is their reproductive specialization, which goes along with a genetic structure of a colony in which the superorganism of the colony benefits overall from a majority of individuals not reproducing. This is also dramatically different from human societies. It has been objected to Wilson’s thesis of the eusociality of human beings that human beings are not eusocial, but rather prosocial, and that human cooperative societies cannot be compared to insect cooperative societies because there is no parallel to reproductive specialization among human beings. This, I think, is an unnecessarily narrow conception of eusociality. All we have to do is to recognize that eusociality can take multiple forms (as minds and intelligence can take multiple forms, supervening upon multiple distinct neural structures), some of which involve reproductive specialization and some of which do not, in order for us to recognize human cooperative societies as eusocial. The most developed brain of the molluscs is that of the octopus, a solitary hunter. Octopi have been hunting in the depths of the sea for hundreds of millions of years, and, apparently, they have never experienced competition on the basis of intelligence, and, perhaps because of this, have never experienced an encephalization event. (Recently in How early a mind? I quoted E. O. Wilson to the effect that, “A Homo sapiens level of intelligence can arise only on land, whether here on Earth or on any other conceivable planet.” ) So octopi have a respectable level of intelligence, but are far from being eusocial. The eusocial insects have a much less powerful brain than octopi or mammals, but they did make the breakthrough to eusociality. Only human beings made the breakthrough to both eusociality and high individual intelligence. Since reading Wilson on the eusociality of human societies, I can come to think that human civilization is what happens when eusociality coincides with intelligence. Termite mounds and bee hives are what happens when eusociality coincides with insect-level intelligence. And this observation of the interaction of eusociality and intelligence immediately suggests two possible counterfactuals to human civilzation, which I will sketch below. Understand that, in this context, when I use the term “human civilization” I am using this is in its most generic signification, covering all the many different human civilizations that have existed, i.e., the class of all human civilizations (which is the class of all known civilizations constructed by a biological being both eusocial and intelligent). I noted above that we can employ a conception of eusociality less narrow than that restricted to eusocial insects with reproductive specialization. Similarly, the other element in civilization — intelligence — ought also to be construed broadly. Many different kinds of intelligence interacting with many different kinds of eusociality suggest many different possibilities for civilization distinct from the class of human civilizations. At the present time I am not going to consider kinds of eusociality and intelligence as much as degrees of eusociality and intelligence, and I will assume that the insect transition to reproductive specialization represents eusociality taken to a higher degree than eusociality has progressed in human beings. Similarly, I will assume that human intelligence represents a higher degree of intelligence than now-extinct branches of the genus homo, i.e., our ancestors with lower degrees of encephalization and lower intelligence. A species might be less intelligent than human beings (i.e., possess a lower degree of encephalization) but more eusocial than human beings, and be able to build a civilization. A species might be more intelligent than human beings (i.e., possessing a higher degree of encephalization, or a thicker neocortex) but less eusocial than human beings, and be able to build a civilization. This formulation has the virtue of existing human civilization embodying the principle of mediocrity: our eusociality and intelligence are balanced; we are not as eusocial or as individualistic as we might have been, and we are not as intelligence or as unintelligent as we might have been. We are in the “Goldilocks zone” of coinciding eusociality and intelligence, and this human “sweet spot” for civilization may account for the fact that civilization emerged independently in widely separated geographical regions, not as a result of idea diffusion, but rather as a consequence of independent invention. In the High Eusociality/Low Intelligence class of civilizations, we would see somewhat individually intelligent beings capable of a high degree of cooperation through eusociality forming socieites (superorganisms) quite early in their history. We can see the degree to which bees and ants and termites can develop societies based on eusociality and an almost negligible individual intelligence; with a degree of eusociality approaching this, but in a species endowed with more cognitive capacity, cities might be built that look like something between a human city and a termite mound, and this might happen spontaneously. If this had happened with an earlier human ancestor — a counterfactual ancestor with greater eusociality than any actual human ancestor — it could have preempted the emergence of human civilization by occurring millions of years earlier. In the Low Eusociality/High Intelligence class of civilizations, civilization may have come about at the level of scattered bands of hunter-gatherers, or, at least, human beings in small groups may have been able to develop science and technology without large social institutions such as governments, universities, and corporations, which discipline unruly human beings and make it possible for them to work cooperatively together. One can imagine that a more intelligent (counterfactual) species of the genus homo might have been sufficiently intelligent to pursue science at a much earlier period of its history, and one can imagine members of such a species coming together for scientific purposes much as our ancestors came together at Göbekli Tepe (which I first wrote about in The Birth of Agriculture from the Spirit of Religion) possibly for religious rituals, even before they gathered in settlements for agriculture. Both counterfactual scenarios I have described above could have resulted in civilization on Earth emerging tens of thousands or hundreds of thousands of years earlier than it did in fact emerge. I suppose it would be equally possible to formulate counterfactuals in which different classes of civilization emerged much later. Each of the three classes of civilizations considered here — moderate eusociality/moderate intelligence, high eusociality/low intelligence, and low eusociality/high intelligence — have distinct advantages and disadvantages, in terms of the viability of the civilization that results. However, cognitive capability begins to play a much greater role in civilization after industrialization when civilization becomes technological and scientific. If a given civilization can survive to make the breakthrough to science-driven technology, all other things being equal, the species with the greatest intelligence will have the greatest advantage in deploying science to further the ends of that species. I suspect that a high eusociality/low intelligence civilization would be stagnant, and possibly so stagnant that the breakthrough to industrialization never occurs. I also suspect that human beings were just smart enough to make that breakthrough, as indicated by the single point of origin of the industrial revolution. Short of that threshold, any civilization remains cosmologically invisible, exclusively bound to its homeworld, and incapable of long-term existential risk mitigation. This scenario is consistent with the great silence, and may constitute another approach to the Fermi paradox. The research questions that follow from these considerations include: Are there intrinsic limits to eusociality among beings whose biology is not consistent with reproductive specialization? Are there intrinsic limits to intelligence for biological beings of known biochemistry? How do eusociality and intelligence interact biologically and ecologically? Does either constitute a check upon the other? Cooperation among human beings has its limits — as illustrated by the story of the Tower of Babel — and one limit to cooperation is our level of eusociality. With a higher or lower level of eusociality, civilization would have had a different structure. Is encephalization the great filter? Hominid encephalization reveals an exponential growth curve. Discussion of the Great Filter has focused on singling out one factor and identifying this one factor as the Great Filter, although Hanson is explicit that, “one or more of these steps are very improbable.” In the event that several steps in the development of explosively expanding life rather than some one single step is unlikely, the Great Filter may consist of several elements. I think that this is an important qualification to make, but at present I will adopt the conventional presumption that one step in the development of advanced civilization is improbable (or especially improbable) and constitutes the Great Filter. Graph of the encephalization quotient of several mammals. What we know about the cosmos is consistent with it being rich in life, but poor in technologically advanced civilization. The more that we learn about exoplanetary systems (living, as we do, in the Golden Age of exoplanet discovery), the more our scientific understanding of the universe points toward a superfluity of habitable worlds (or, at least, potentially habitable worlds), even while no trace of intelligence has yet been seen or heard beyond Earth. Some of this may have to do with the amount of research funding that is channeled into astronomy and astrophysics in comparison to SETI research, which has received relatively little to date. This is about to change. A “Breakthrough Initiative” will be funneling a large amount of money into SETI — Breakthrough Listen — but there is no reason as yet to suppose that this effort will be any more successful than past efforts, though I would be quite pleased to be proved wrong. Brain to body mass ratio is distinct from encephalization quotient (EQ). Comparative brain sizes of several mammals. When, in the coming decades, we are able to obtain spectroscopic analyses of exoplanet atmospheres, our knowledge of what is going on on exoplanets — as opposed to merely knowing about their existence, location, size, orbital period, and so on, which is the kind of scientific knowledge we have only recently come into — will improve by an order of magnitude. At this point in time we will move from ne in the Drake equation (number of planets, per solar system, with an environment suitable for life) to fl (fraction of suitable planets on which life actually appears) and possibly also fc (fraction of civilizations that develop a technology that releases detectable signs of their existence into space, from which we can infer fi, fraction of life bearing planets on which intelligent life emerges) if exoplanet atmospheric signatures reveal signs of unambiguous industrial activity. We do not know the prevalence of life in our galaxy, much less in the universe at large — i.e., whether or not we live in a biota-rich GHZ, or even CHZ (cosmic habitable zone) — but we may soon be able to estimate the presence of life in the cosmos as we can now estimate the number of planets in the cosmos. It is entirely possible that the universe is teaming with life, even advanced life that is as sophisticated as the life of the terrestrial biosphere. I have written elsewhere that we may live in a “universe of stromatolites” (cf. A Needle in the Cosmic Haystack), but we may also be living in the universe rich in the ecological equivalents of sharks, koalas, and penguins. With one exception: the emergence of the cognitive capacity that makes abstract intelligence possible as well as the civilization that is predicated upon it. 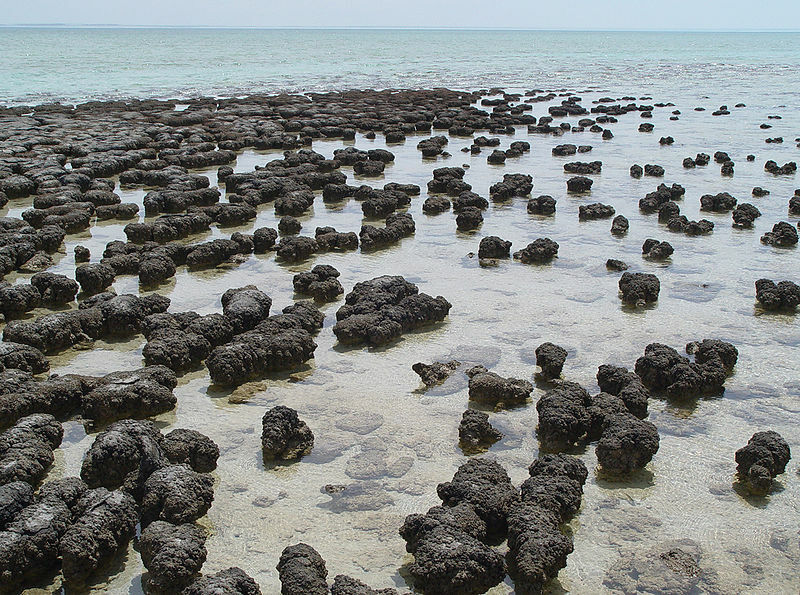 Do we live in a universe of stromatolites? In an earlier post, A Note on the Great Filter, I suggested that we are the Great Filter. I would now like to refine this: if I were to identify a “Great Filter” (i.e., a single element constituting the Great Filter) somewhere between plentiful life and absent advanced technological civilizations, I would put my finger on hominid encephalization. It was the rapid encephalization of our hominid ancestors that made what we recognize as intelligence and civilization possible. While there are many other large brains in the animal kingdom — the whale brain and the elephant brain are significantly larger than the human brain — and other mammals have brains as convoluted as the human brain — meaning more of the neocortex, which makes up the outer layer of gray matter — the encephalization quotient of the human brain is significantly greater than any other animal. Brain size in absolute terms may have to exceed a certain threshold before intelligence of the sort we seek to measure can be said to be present. Neurons are of a nearly constant size, so the minimal neuronal structure necessary to control bodily functions take up about the same space in a mouse and an elephant. Factors other than sheer brain size are relevant to brain function, as, for example, the portion of the brain made up by the cerebral cortex and the amount of convolutions (therefore outer surface area, and the cerebral cortex is outer layer). Hence the introduction of encephalization quotient: encephalization quotient is not simply a ratio of brain mass to body mass, but is also based on the expected brain size for a given body plan — this introduces an admitted interpretive element into EQ, but that does not vitiate the measure. When, in the distant future, we can compare EQs over many different species from many different biospheres, we can firm up these numbers. Someday this will be the work of astroneurology. The ‘WOW!’ signal — fugitive signature of intelligence in an otherwise lonely universe? Perhaps astroneurology will someday study neural architecture across biospheres and arrive at a non-anthropocentric measure of intelligence that could account for something like the ‘WOW!’ signal. The human brain (with its distinctive and even disproportionate EQ) has not changed since anatomical modernity — at least a hundred thousand years, and maybe as much as three hundred thousand years — and human thought has probably not greatly changed since the advent of cognitive modernity, perhaps seventy thousand years ago. We must continually remind ourselves that even the earliest anatomically modern human beings had a brain structurally indistinguishable from the human brain today. With the blindingly rapid gains of technological civilization over the past hundred years it is increasingly difficult to maintain a sense of connection to the past, not to mention the distant past. But when the human brain appeared in its modern form, it was unprecedented in its cognitive capacity — it was and still is an extreme outlier. There was nothing else like it on the planet, and from this brain followed control of fire, language, technology, art, and eventually civilization.